The following procedures are courtesy of the Carpet and Rug Institute, the trade association representing the major carpet manufacturers. 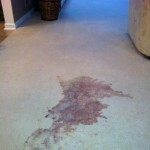 · Pretest any spot removal solution (for color transfer to the cloth or damage to the carpet) in an inconspicuous area. If a change occurs, select another solution. 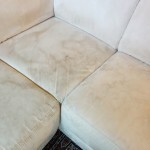 · Apply a small amount of the solution to a white cloth, and work in gently – do not rub — working from the edges of the spill to the center to prevent spreading. Allow to remain on the spill a few minutes. Be patient. Blot. · Continue to use the first agent as long as there is a transfer of the spill to the cloth. Be patient. Complete removal may require repeating the same step several times. Or, you may need to move to the next solution. 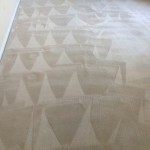 · When the spill is completely removed, rinse the area with cold water; blot with a dry cloth until all moisture is removed. 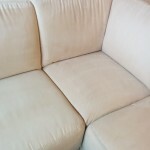 A non-flammable spot removal solution, or dry cleaning type solvent, is preferred. Exercise caution when using a solvent, and follow manufacturer instructions. 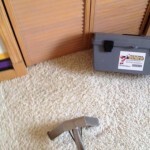 Never pour it directly onto the carpet or allow it to reach the backing, because it can damage the latex that holds the primary and secondary backings together. Solvents are readily available in the cleaning supply section of hardware and home supply stores. Mix one fourth (1/4) teaspoon of a liquid dishwashing detergent per one (1) cup of lukewarm water. NEVER USE A STRONGER CONCENTRATION! Thorough rinsing is necessary to remove detergent residues that may cause rapid soiling. 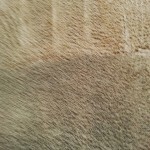 It may be necessary to rinse with warm water several times to completely remove residues. (See Residue Precautions.) Care should be used in selecting a detergent. Never use a laundry detergent of any type, because laundry detergents may contain optical brighteners (fluorescent dyes) that dye the fiber. Do not select an automatic dishwashing detergent because many contain bleaching agents that destroy dyes and some fibers. Mix one (1) cup of white vinegar per two (2) cups of water. White vinegar is a 5% acetic acid solution. It is used most often to lower the alkalinity caused by detergent solutions or alkaline spills. Note #1: Dry solvents can be relatively safe (such as using isopropyl alcohol to remove ink) to being likely to do some damage to carpet construction if not used very carefully (naphtha or citrus solvents). 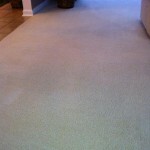 Note #2: Wool carpet is more sensitive to alkaline spots and spots removal agents than synthetic carpet. If you use an alkaline product, it would be beneficial to rinse with the vinegar solution before rinsing again with water. 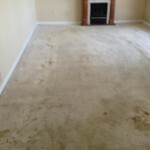 For particular spot removal recommendations, follow this link to the Carpet and Rug Institute’s spot removal guide.